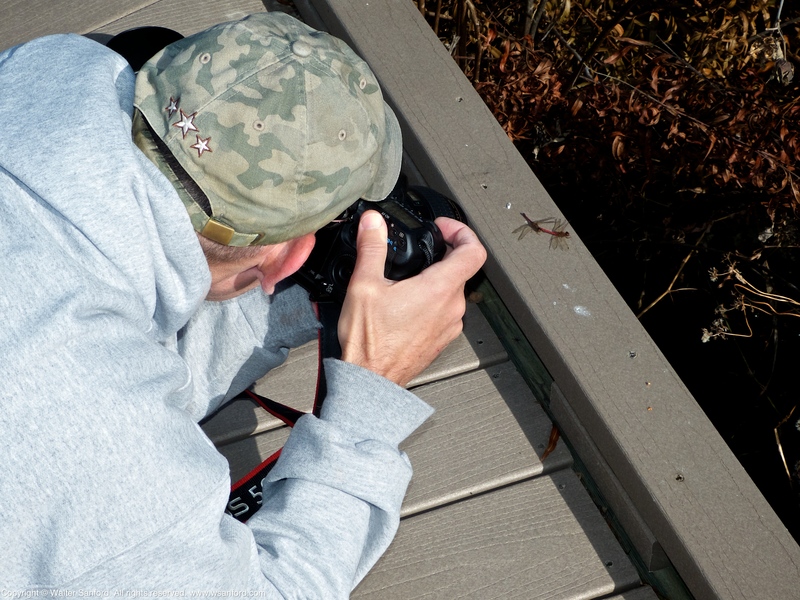 The following photograph shows Mike Powell shooting a mating pair of Autumn Meadowhawk dragonflies (Sympetrum vicinum) resting in tandem on the boardwalk at Huntley Meadows Park. The pair of dragonflies went into wheel minutes later, as shown in the following time-series of photos. Copyright © 2013 Walter Sanford. All rights reserved. This entry was posted on December 30, 2013 at 5:00 am and is filed under Aperture, digital photography, dragonflies, natural science, Panasonic DMC-FZ150. You can follow any responses to this entry through the RSS 2.0 feed. You can leave a response, or trackback from your own site. Fascinating action sequence of photos of the dragonflies in action. No matter how many times I see dragonflies mating, I am always amazed by the acrobatic process.